15/52 - Jebel Hafeet | Flickr - Photo Sharing! 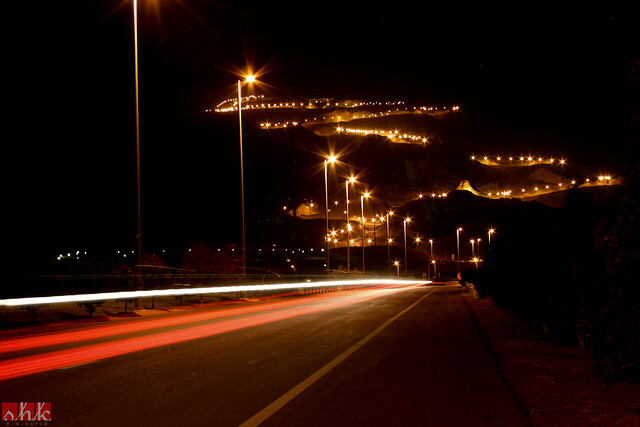 The light trails leading up to the summit of Jebel Hafeet (Mount Hafeet) which reaches over 1200m. We stayed at a hotel near the summit with a splendid view of the city of Al Ain, UAE. Tony Baldwinson, and 5 other people added this photo to their favorites. Lovely photo. The light bulbs and the lighted top parts of the mountain look like floating on space. Beautiful capture. Nice traffic trails and zigzagging lit road in the distance, Sogs!